Concept to Design, Prototype to Finished Article. 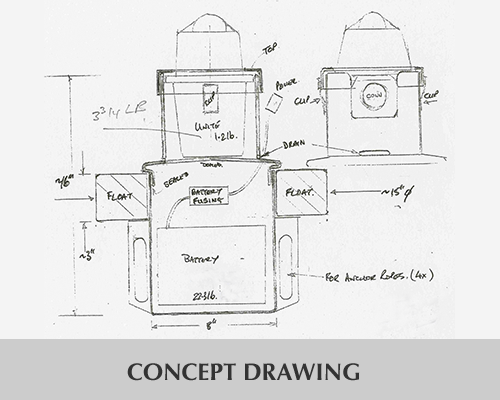 Using the latest engineering design software like Solidworks we bring your ideas and product designs to life. Single or multi-cavity molds designed using the latest CNC milling machines and the material of your choice. With 50 years of injection molding, over molding and insert molding experience, we've seen and done it all. Hope Plastics is a family owned business. Don Borden who began working in the plastics industry in 1946 went on to form Hope Plastics in 1964 with his wife and two sons. Starting out in a single-unit industrial complex, three machines soon grew to nearly 20. In 1974, Hope Plastics moved to its present location in North Hollywood, CA. where three generations work together to solve a wide range of product design, molding and manufacturing challenges for a diverse group of customers. Hope Plastics provides injection molding, overmolding and also insert molding of metal and plastics. The slides to the right illustrate an actual development sequence from concept to model to prototype to finished product.